Arnold J. Susser, R.P., Ph.D and Beth M. Ley, Ph.D. Leading U.S. medical authorities consider obesity to be our most widespread nutritional disorder. An estimated 300 million Americans are currently obese. Every year we spend billions and billions of dollars on diets and diet-related products... and we are still fat. Nutritionist Arnold Susser, R.P., Ph.D., together with nutrition writer Beth Ley, Ph.D. team up to tell you exactly what you are doing wrong and the easiest and best way to eat yourself trim and healthy in no time.There’s no calorie counting, no food weighing, no fasting, no expensive powdered drinks to mess with, no starving, no irritability, no drugs, and WHAT?! No Dieting! Get the Facts about supplements that work and those to avoid. Learn about 5-HTP, Chitosan, Chromium, DHEA, Coleus Forkohii Root, Guggul, MaHaung (ephedra), Yohimbine and other thermogenics (fat burners), Garcinia cambogia, essential fatty acids, amino acids, fiber and much more! Learn how to sift through all the confusing marketing gimicks and get the plain simple facts. 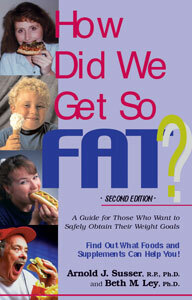 Start reading… What have you got to lose… But Fat?